This recording (STR 37120) has a quite special interest. It includes six different pieces by Italian vanguard composer Nicola Sani. These compositions were created during the years when Sani was a major music organizer on the national scene in various capacities - Superintendent and Musical Director of the Teatro Comunale di Bologna, Musical Director and Board member of the Teatro dell'Opera di Roma, President of the Istituto di Studi Verdiani in Parma and of the Fondazione Isabelli Scelzi in Rome, as well as other managerial positions. Now, Nicola Sani shares his time between composing and the artistic direction of Accademia Chigiana in Siena. He is quite well known, not only in Italy but also in Germany and in the United States. Whilst at the Chigiana Summer Academy and Festival he has the opportunity to give room and relevance to contemporary and vanguard music. In his assignments at the Teatro dell'Opera and, more so, at the Teatro Comunale di Bologna, he had to follow box office demands and audience interest for traditional popular titles. Nonetheless, he made major efforts to offer modern and contemporary music, although not really vanguard, to the general public. The compositions on this CD span a twenty year period, 1996-2015. They have a key theme: the immensity of time and its unfolding in a boundless space. This theme relates them to the works of Domenico Giacchero, Giacinto Scelsi, Karlheinz Stockhausen and Luigi Nono. 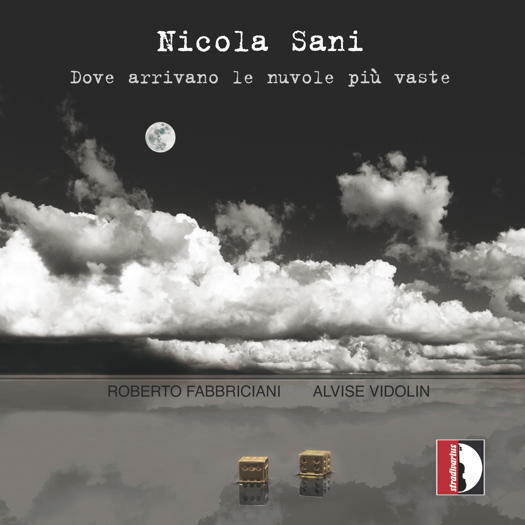 As compared to other works by Sani - eg Elements on STR 33766 from 2006), they are nearly minimalist as they require only a flute (Roberto Fabbriciani) and an electronic console (Alvise Vidolin). The first piece, I binari del tempo ('the tracks of time', composed in 1998), is a dialogue between the flute and electronic console. It leaves a lot of room for improvisation by the interpreters and provides a very good sense of the immensity of time through the skillful use of moments of silence. Imagine from butterfly (2002) is a tender elegy like the flight of a butterfly. There is no narrative, but just feelings and emotions. Instead, Dialoghi Migranti ('migrant dialogues', also composed in 2002) is very dramatic, even if it is composed for just a soloist - a flute in G. The flute talks to himself, in a tense series of questions and answers about its fate and its future. There is real drama without action but only with the virtuoso sound of the flute. The piece also has a social slant, due to the relevance of migration issues in Italy - within the country and from Italy to abroad until the mid 1960s, and from Africa to Italy during the last twenty years. The flute is also the protagonist of Dove arrivano le nuvole più vaste ('where the largest clouds arrive', 1996), the piece that provides the CD's title. It has a duration of nearly fifteen minutes, whilst the others are much shorter. The flute extends to C two octaves below middle C, and live electronics as well as digital synthesis of magnetic tape transform the flute from a monophonic into a polyphonic instrument. The technical aspects are well described in the CD booklet. For a listener not specialized in vanguard electronic music, the most interesting feature is the transformation of the sound of a note into a chord of eight different pitches. This creates micro intervals and great mobility to describe 'where the largest clouds arrive' and to express the immensity of time in a boundless space. Un soufflé le soulève, les dunes du temps ('a breath lifts the sand dunes of time', 2012) is a verse of a poem by writer and composer Giacinto Scelsi. Here the alto flute and the digital soundtrack become poignant. The last composition here, More is Different, is quite an elaborate fifteen minute piece for hyperbass flute, live electronics, motion capture and digital support. It captures the composer's introspective journey through the immensity of time and space. The performances by Roberto Fabbriciani and Alvise Vidolin, frequent collaborators of Nicola Sani, were just superb.